We are about embark on our fourth year of the Smithsonian Early Explorers program. The upcoming anniversary is a little bittersweet as some of our long-time families are leaving the program and moving on to preschool. 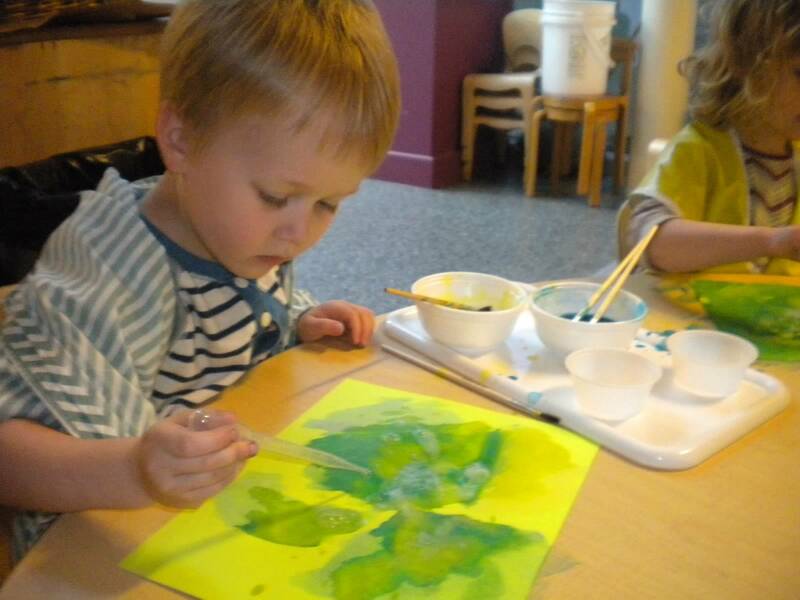 The toddlers who began this program have grown into competent three-year-olds who are capable, empathetic, and ready for their next big adventure. The adults will also be missed as they have become part of our SEEC community and really helped us reflect on the overall program. To celebrate the development and growth of the program and it’s students, I thought it would best to tell the story of SEE through photos in the hopes of capturing what makes this program so unique. Like many early education programs, we begin our day with a schedule. SEE also includes a “Question of the day.” Our belief is that asking questions can lead to a life-long habit of analysis and critical thinking. These questions also help caretakers who are not present learn about their child’s day. Each morning we invite our students to play and often include real objects or materials. This helps create authentic experiences that support a child’s physical, cognitive, and emotional growth. 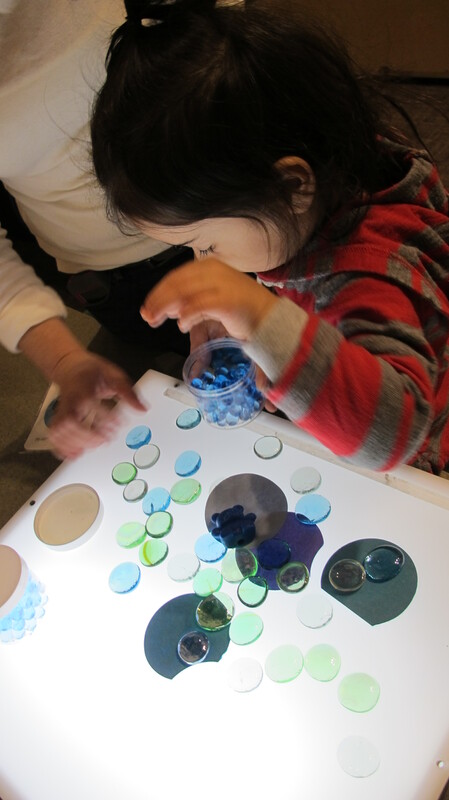 By including real objects, children can have concrete experiences that engage their senses. The photo here shows a lesson in which children explored different types of green as part of a larger study on forests. We also create imaginative spaces using traditional toys. 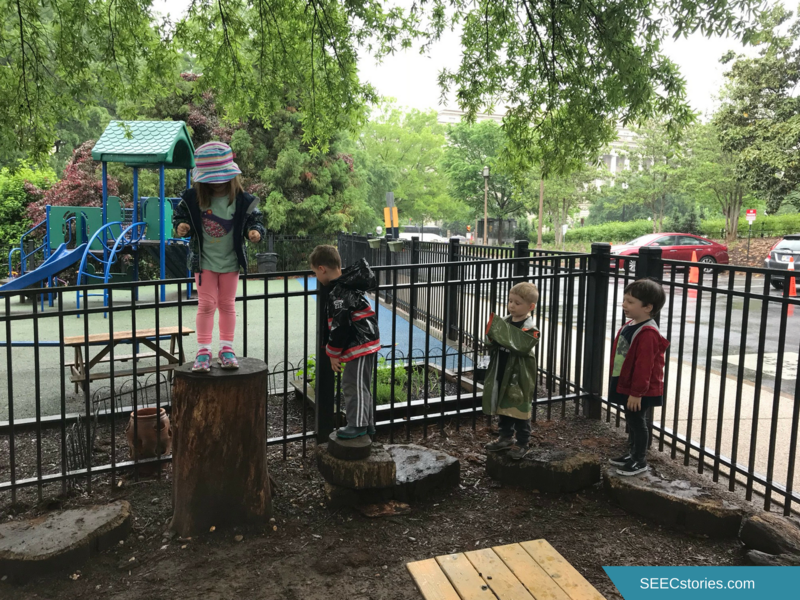 Our class meets in the Natural History museum’s Q?rius Jr. space and our educators are thoughtful to design a learning environment that encourages imagination and creativity. We also believe in getting dirty and having fun. Another cornerstone of our program is routine. Each morning the children look forward to ringing the bowl to indicate it is time to gather. Following that, we welcome each other with a our hello song. We often choose books that are regularly reread over the course of the trimester. As the children become familiar with a piece of literature, they delight in knowing what will come next and matching photos to the text. 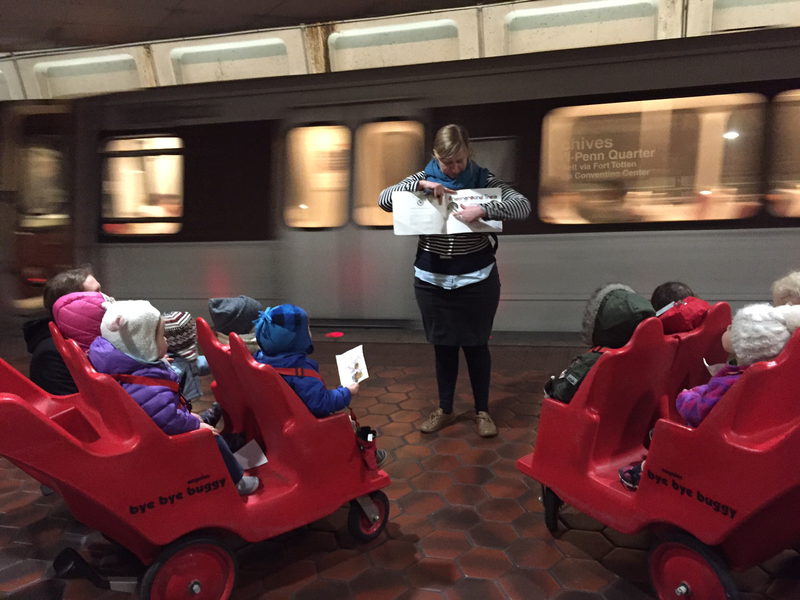 When we depart for snack and our museum visit, the children get on “trains.” They hear the sound of the whistle and know that they need to grab an adult hand and walk safely to their next destination. These routines help the children feel safe, know what to expect, and help the whole group transition. We are a museum school and therefore, regularly visit the museums on the National Mall. 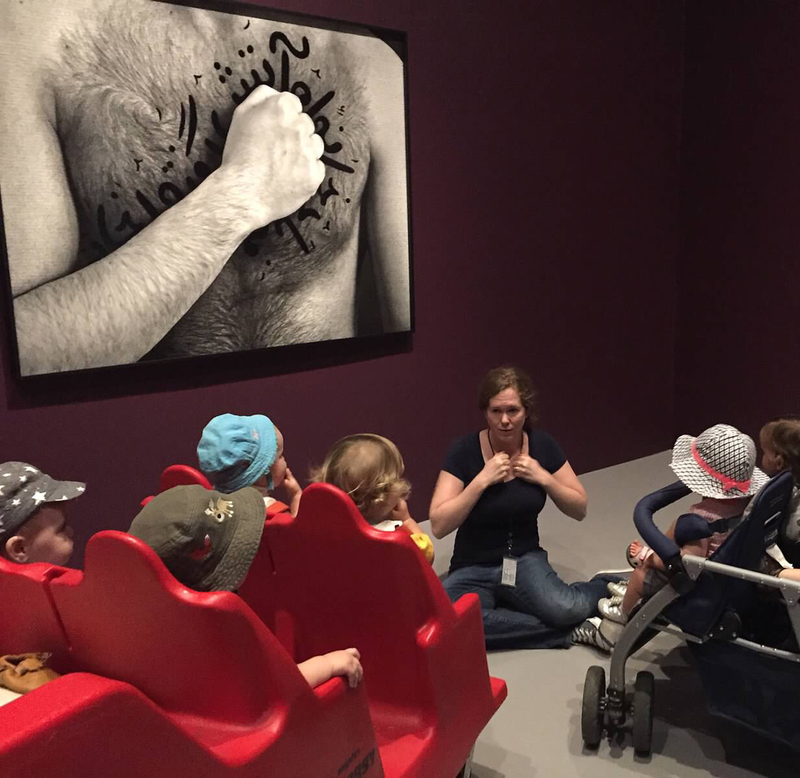 Learning in museums can be beneficial to young children especially because they are better able to learn when they connect more concretely with subject matter that they actually experience. SEE does not limit itself though – we see our classroom as extending beyond the National Mall and museums. Some of our highlights this year were the DC Circulator and the National Arboretum. We also take advantage of new exhibitions even when they don’t tie into the curriculum, as was the case with the Kusama show at the Hirshhorn Museum. Really, who could pass up such a fun experience?! We believe in play and we believe it should happen in museums. I know for some that might seem contradictory to museum etiquette, but we believe that play can and should happen in museums. With some forethought it can be done successfully with young children. Below you will observe how bringing some loose parts allowed one child to build a structure of his own. He was no doubt inspired by the house on view in the American History gallery where he was You can also see how we transformed a lesson on maple leaves into a game of placing leaves onto a tree. Finally, and perhaps one of my favorites, watch both the children and adults have fun practicing their penguin walk at the Natural History Museum. SEE is a program that not only supports the child, but the parent/child relationship. Our educators help parents in their role as their child’s first teacher. We try to educate our parents on issues of child development and assist them as they navigate specific situations with their child. Caretaking is hard work and we use daily interactions, weekly emails, and conferences as ways to help parents navigate these early years. It takes a village and SEE is a community which relies on it’s families and staff to help cultivate a diverse learning experience and strong community. Below are just a few examples: one grandmother shares her sticky rice after viewing bowls from the Sackler Gallery, our resident science educator, and retired entomologist, shares his expertise and live specimens, a small potluck marks the end of a trimester, and one child focuses during their monthly visit to our art studio. We are proud of the Early Explorers program for not only its use of museums, but its approach to educating the whole child, supporting families, and creating community. We wish our graduates well and look forward to meeting our new students in the fall! Do you have a child who will be between the ages of 18 – 24 months this fall? You may want to consider joining the SEE program. We are hosting our Prospective Student Day on May 24. During the day, we invite families to participate in the program to experience it for themselves and have the opportunity to talk to other families. Join us by registering here. This blog was first published last spring during NAECY”s Week of the Young Child. We decided to re-post it as we so often get ask the question, “What do you do with babies in a museum?” We hope this answers some of your questions. If you are interested in seeing our work in action, families are welcome to join us for one of our Infant Investigators classes that occur most first Saturday and Sundays of the month. When I first discovered that the theme for NAEYC’s 2016 Week of the Young Child™ was “Celebrating Our Youngest Learners,” I was excited by how clearly it related to my work as an infant and toddler teacher. Most people who read the phrase “Celebrating Our Youngest Learners” would immediately think of children older than the ones I work with every day. Even among the early childhood community, the term “young learners” often refers to Pre-K and Kindergarten students. I believe that we should include infants and toddlers in our celebration of the youngest learners. In my mind this is something that is both natural and necessary. In fact, it has so permeated my life that I sometimes forget that not everyone feels the same way that I do. While I understand that a class of infants and toddlers may be an unusual sight in a museum, I can’t help but be baffled by the very premise of their question. My audible response to this accusation is a cheery “Never too young,” but my inner dialogue consists of wondering “Too young for what? 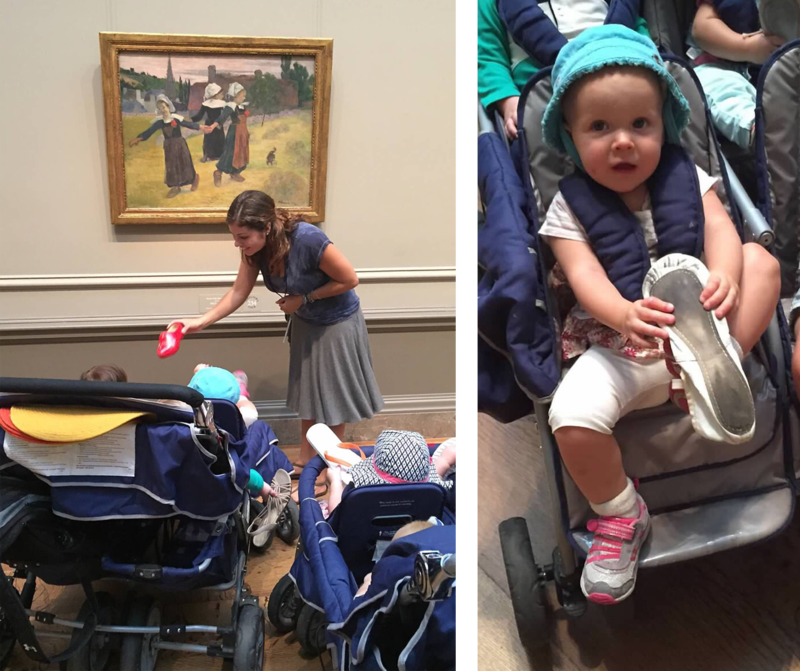 Too young for learning?” I believe that museums make ideal places for self-directed learning. For an infant or toddler to be considered too young for a museum, then the extension of that logic is that the child is too young to learn, which cannot be further from the truth. To discover more about different types of shoes, such as wooden clogs and ballet slippers, we went to the National Gallery of Art to see Paul Gauguin’s Breton Girls Dancing, Pont-Aven (1888). For a toddler, shoes represent a way for them to start creating a sense of autonomy. In my class, my students often come dressed in pink cowboy boots or purple rain boots that they picked out themselves. They are expressing their new found independence by choosing what shoes or clothes they want to wear. Infants and toddlers expend much of their energy discovering how they can move. Here my class of mobile infants visited a termite mound at the O. Orkin Insect Zoo in the National Museum of Natural History, which they were able to crawl through. Getting new teeth impacts so many aspects of the lives of infants and toddlers. It allows them to transition to eating solid food, affects their mood, and is often detrimental to their sleep. What better way to learn about what is happening inside their own bodies, than to examine the jaw of a great white shark and touch a replica of some of the shark’s teeth in the Sant Ocean Hall at the National Museum of Natural History. Great strides have recently been made in explaining the importance of Pre-K and Kindergarten to the public. 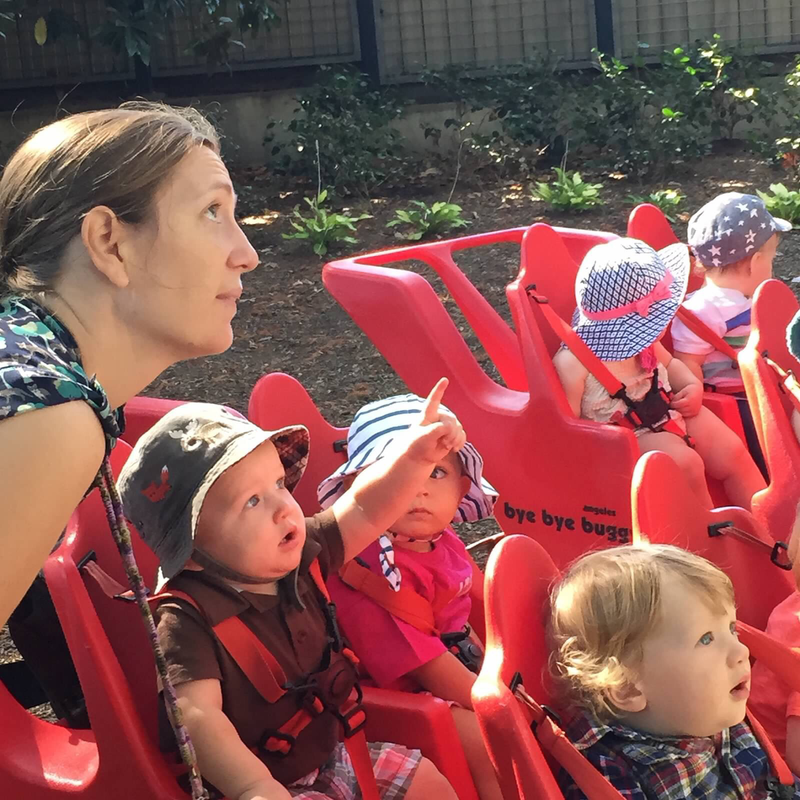 People across the nation now believe in the importance of these early learning experiences. While there is more work to be done, it is important that do not waver from celebrating and supporting the youngest of the young learners — infants and toddlers. Infants and toddlers are active learners, so the environment and the people they interact with impact their learning. 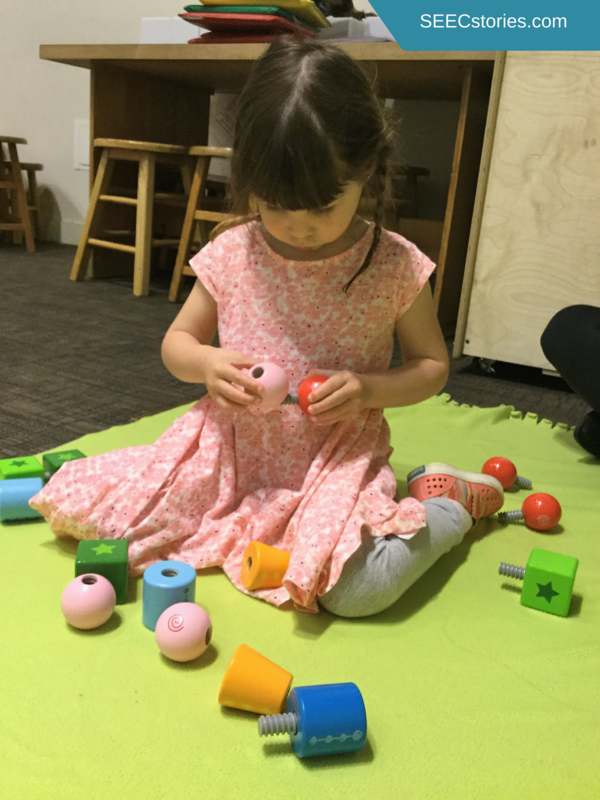 Infant and toddler educators need extra support and should be encouraged to see the myriad of possibilities for learning that occur with infant and toddlers every day. I hope that one day everyone who hears the term “youngest learner” will automatically include infants and toddlers in that group. I am excited for the day that I am greeted with “What are they learning about?” when I am walking in the museum with the infants and toddlers in my class. 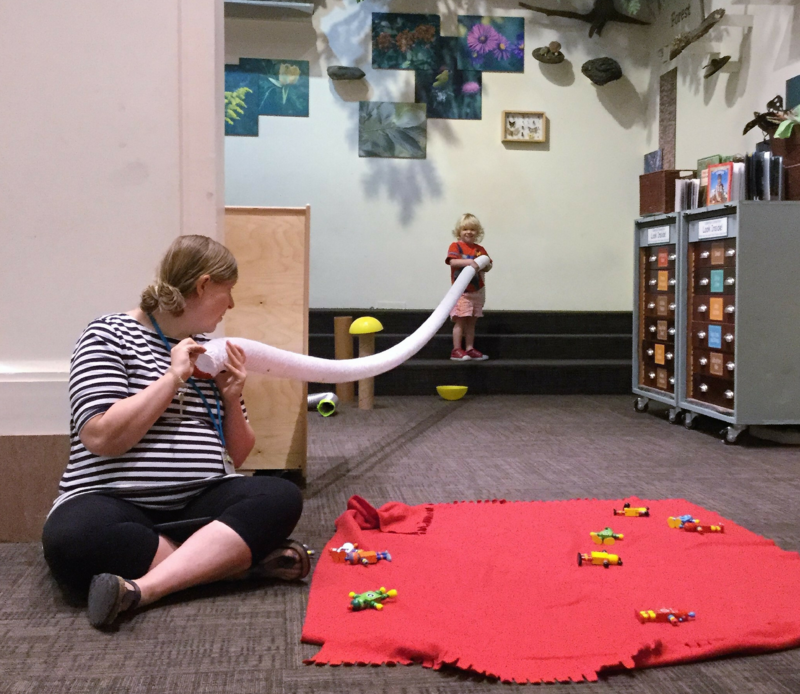 Meredith Osborne is the infant and toddler specialist at the Smithsonian Early Enrichment Center. She received her Master’s in museum education from The George Washington University and studied history and psychology at Ohio Wesleyan University. She has experience working with both children and adults including positions at Playgroup in the Park, the Children’s Museum of Cleveland, teaching adults literacy classes, and interning at the Supreme Court of the United States. One of the first things we do with our young children is teach them the colors. As I sit and write this blog, I can hear families arriving for school and parents talking to their children about what they see in their environment and describing how they look – and most often I hear parents describing colors. Color helps us identify, sort, and can even elicit an emotional response. All too often though we, parents and educators, think of color in terms of art. No longer! The Smithsonian Libraries’ exhibit Color in a New Light will open up a whole new world and make you think about color in ways you haven’t before. To put it in perspective, Sara Cardello, Education Specialist, at the Smithsonian Libraries has provided us with four fun STEM (science, technology, engineering, and math) facts about color that will get you excited to learn more about color with your little one. 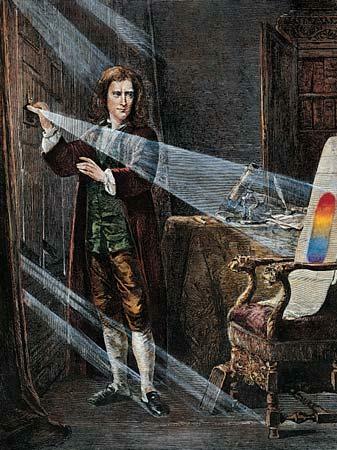 Did you know that in 1666, Sir Isaac Newton, an English physicist and mathematician made an important observation? He noticed, when looking through a prism, clear light was not clear after all. In fact, it was made from seven different colors, which we now know as the rainbow. These colors cannot be seen by our eyes all the time, but science has proven that in the right settings we can see that our light is very colorful! Did you know that before the 1880s all colors were made from natural dyes? It was not until an accident in 1856 that we got our first synthetic way to make color. William Henry Perkins, an English chemist, was searching for a cure for malaria. While experimenting with coal-tar, he noticed an oily residue left a vibrant purple stain on some silk. While the cure for malaria was not found, a new process to create synthetic dye was discovered and changed the technology of color forever. Henry Ford is credited with creating the affordable and mass produced automobile in America. The Model T was originally sold in red, gray, green, and black. But as demand rose for the car, production was not able to keep up. From 1914 to 1926 Ford only offered the Model T in black, because it dried the quickest. It wasn’t until a more efficient assembly line was engineered by Ford that they could begin producing the car in various colors and keep up with the booming automobile industry. Robert Ridgeway was the first curator of birds for the Smithsonian in 1880. One of the things he noticed were all of the different colors used to describe the animals, which made it confusing for scientists. In 1886 he created A Nomenclature of Colors for Naturalists which helped count, sort, and order all the different colors and name them, like Warbler Green. His work helped take the mathematical guess-work out of bird watching! SEEC and the Smithsonian Libraries will host an open Color Studio on Saturday, July 16. Don’t let the name fool you though, our color activities will be STEM inspired. We plan to mix and create our own colors, make our own paint, make rainbows and make a color-inspired mural. Following your studio experience, families will be given a guide to the Color in a New Light exhibit. Join us for our upcoming Artful Afternoon featuring Color.